This Double Masters Degree program is a smart partnership that brings benefits to the candidates in terms of countless experience and global perspectives during their learning process. They will be exposed to the experts and the numerous resources from two different Universities from two different countries. The strengths and the advantages of each university can be synergized through this program thus making it more valuable compared to other master’s programs. This degree is recognized and accredited in both countries and this puts the candidates at a more advantageous position than their peers from the other programs. English language is the main medium for teaching & learning activities. Graduates of the program can work as Information Assurance Analysts, Information Security Officers, Information Assurance Architects, Information Assurance Managers, Academics, Security Analysts, Information Assurance Policy Developers, and Information Assurance Risk Analysts. This program will be conducted at Advanced Informatics School (UTM AIS), Universiti Teknologi Malaysia, Kuala Lumpur in Semester 1 and 2, and at Deakin University in Semester 3 and 4. Semester 1: Data Quality Assurance, Research Methodology, E-Crime Investigation and Incident Response Management, Biometrics in Information Assurance, Information Engineering, Cyber Law & Ethical Issues. Semester 2: Enterprise Information Assurance, Applied Cryptography, Penetration Testing and Intrusion Mechanism, Information Assurance Project 1, Access Control and Perimeter Protection, Informatics in Society. 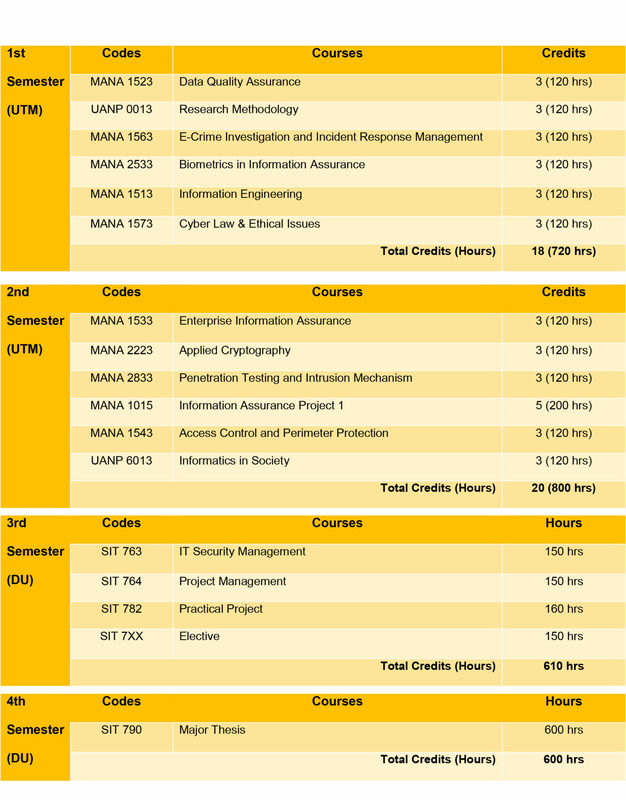 Semester 3: IT Security Management, Project Management, Practical Project, & Elective. This course discusses the principles of research methodology which include a general introduction to postgraduate research, its methodologies and organization. It is designed to support postgraduate students in developing their research proposal and to guide students through a range of issues and considerations which should inform their general approach to research. Students will learn a range of research tools, and will be equipped to plan and organize their research, as well as to communicate their findings. This course will discuss on how to conduct computer forensic from acquiring digital evidence to reporting their findings. It includes how to set up a forensics lab, how to acquire the necessary tools and how to conduct an investigation and subsequent digital analysis. The laboratory part of this course will include working with Encase – a suite of digital forensics tools from Guidance Software. In addition there will be labs on network forensics, VoIP (Voice over IP) forensics and video forensics which will give students practical and applied experience with wireless and mobile forensics tools and analysis techniques. The course discusses in depth the principles of biometric in the field of Information security.The course emphasizes the technological aspects of Biometrics and multimedia security (Steganography and Watermarking) and the applications while giving importance to state-of-art technology. The course highlights the technological merger of the Biometrics and multimedia Security in industries such as: Fingerprinting, Face recognition, and others biometrics technologies. Relevant technical topics will be included as hands-on exercise. MATLAB software is used to implement some of hands-on exercise application. Information engineering course focuses on the principles of data models of information in a business enterprise using appropriate software architecture and design methods. The topics include four main components which are (1) Advanced Information System and Information Engineering; (2) Enterprise and Technology Architecture and Organizational Business Strategy; (3) Software Design and Information Retrieval and (4) Managing Digital Data. With the emergence of the technology the misuse of the technology has also expanded to its optimum level eg cyber fraud, cyber defamation, hacking, etc. The misuse of the technology has created the need of the enactment and implementation of the cyber laws but whether this cyber laws are capable to control the cyber crime activities, the question requires the at most attention. Today in the present era we need to evolve a ‘cyber-jurisprudence’ based on what can be evaluated and criticized ‘cyber-ethics’. Further, there is a dire need for evolving Code of Ethics on the Cyber Space and its discipline through cyber law. The purpose of enterprise information assurance and management strategy is to protect an organization’s valuable assets and resources, such as information, people and services. Through the selection and application of appropriate safeguards and control helps the organization meet its business objectives or mission by protecting its physical and financial resources, reputation, legal position, employees, and other tangible and intangible assets. This course will examine the elements of information security assurance, employee roles and responsibilities, and common threats. It also examines the need for management controls, policies, procedures, and strategy. Finally, this course will present a comprehensive list of tasks, responsibilities, and objectives that make up a typical information protection program. some of the issues relating to the management of these services. With the exponential growth of the Internet and networked computers, cyber crime has become one of the most important problems in the computer world. Online credit card fraud, compromised computer servers and other privacy enormities have created a cloud of distrust among online customers. We need to find the best way possible to protect our information systems. A single intrusion of a computer network can result in loss, unauthorized utilization or modification of large amount of data, and cause the paralyses of normal usage of the network communications. Intrusion Detection is identifying unauthorized users in a computer system. This subject is aimed at educating the students with various attack types available and the way to countermeasure those attacks using different Intrusion Detection Systems (IDS) types available. In addition, lab exercises will cover the applications of tools in finding the vulnerabilities and securing the infrastructure. After being assigned problem individually by the supervisor or proposed by student, each student implement his/her own project based on making use of knowledge and skills obtained in previous courses. Student will be guided during the Research Methodology topic provided in this project. Although Information Assurance Project 1 and Information Assurance Project 2 make a set, these are assessed and presented separately at the end of the semester. A complete report must be written and adhere to the UTM Thesis Writing Guideline. This course provides students in-depth knowledge on administrative, technical and physical controls to perimeter protection. Perimeter security risks, its threats and counter measures are discussed. At the end of this course students are able to articulate critically and recommend the various perimeter protection and access control systems in aligning administrative strategies and technical capabilities for any type of organization. 1st and 2nd Semester at Advanced Informatics School (UTM), Kuala Lumpur. 3rd and 4th Semester at Deakin University (DU), New South Wales, Australia. The key focus of SIT763 is on introducing students to IT security policy development and human security management. Students will learn how security assessment is methodologically and procedurally conducted within business operational constraints. The unit enables students to develop contingency planning, risk assessment, risk management and compliance standards for various businesses. Students will also explore legal and ethical issues in the context of security management and audit. SIT764 covers project management within the context of developing information systems in an organisational setting. In particular, it presents project management context and processes; scope, time, cost and quality management; risk management; project teams and resource management; project procurement; and the communication and documentation used through a project’s lifecycle. SIT782 allows the students to learn how to formulate and implement a project. Students will identify a potential problem or technical gap and experience how to solve it using methods, algorithms and techniques pertinent to the field of IT. Students will be required to identity a current topic, undertake essential research to formulate necessary design and/or development strategies, work collaboratively with peers to manage the implementation of the project and demonstrate outcomes achieved against project goals and targets. Research and development skills and abilities are highly in-demand in the IT industry. In SIT790, students will have the opportunity to embark on a research or practice project and develop skills and abilities for informed evidence-based practice. Through research training and mentoring, the unit offers students the opportunity to find and generate information/data, and to use appropriate tools and technologies. Students will learn how to evaluate scholarship and/or practice, gain the confidence to prepare publications and develop skills to become independent researchers. The unit provides scope for further research and higher degree study or professional practice.